When Myles said, one Sunday morning in April 2015, “Shall we buy a motorhome and go travelling around Europe?” he was greeted with a combination of puppy-like excitement and deeply entrenched fear. We had just returned from an incredible six week trip in New Zealand in a hired motorhome, celebrating our 25th Wedding Anniversary. We knew that the trip might ignite the travel bug in our bellies, so his question had plenty of relevance. I was fascinated by my reaction to his romantic vision of packing everything into storage, buying a motorhome and setting off into the European sunset. It seemed so simple, until my ego and scared inner child got involved in the conversation. After what seems a lifetime of fear dominating my experiences, this moment felt poignant as hubby’s question had unveiled a deeply-seated anxiety that needed tackling. As coach, I often see the role fear plays in our lives, and how it impacts on holding us back from our dreams. Perhaps this was the time for me to banish it and release my inner adventurer. Its purpose was to inspire clients to seize the day and find that indomitable ‘happiness’ within, leaving their fears aside. On the surface, it seemed like great advice, yet the one person not truly embodying that philosophy – was me. In truth, from that moment until now, we have been blessed with so many adventures and life-changing decisions, that I must give some credit to my fearless self. 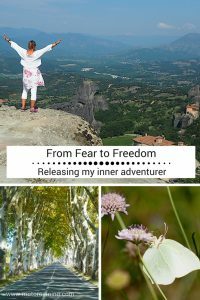 Although as I come back to my husband’s invitation to walk the path of adventure and exploration, I found myself recoiling to the frightened little girl whose best friends were Scary, Fearful and Doubtful! 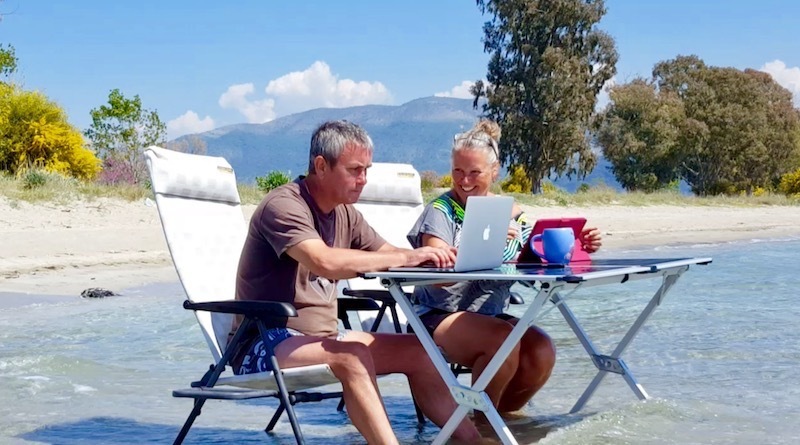 Naturally, there were plenty of discussions over the following months and, despite my discomfort, we did our research and travelled the length and breadth of the country searching for our perfect motorhome. It was as much a symbolic journey as it was physical, with plenty of roundabouts, diversions, traffic lights, dead-ends and one-way streets. Paradoxically, my fear was being fuelled by this journey; I think it was creating a malevolent battle between itself and my desire for freedom. It was just biding its time to attack and render me helpless to its power. We found the van, the model, our ideal layout and the decision was made – then boom! Fear threw his black cloak of doom over me – suddenly, decision unmade! Now I was holding us back from turning our dream into reality. 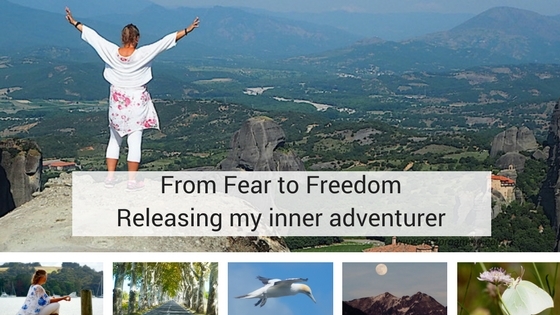 This whole journey really made me examine my fear and its impact on both our lives. I found the courage to get to the heart of its hold over me and discovered that it was anxiety about a lack of roots, insecurity and uncertainty. And yet as I stared fear in the face and understood its personality, I saw it for what it was – simply a self-created construct of False Expectation Appearing Real – and nothing more. Some of this realisation came after a conversation with my dear mum, who told me about how she and dad had the same opportunity to sell up and travel the world, decades earlier. She too ran scared because of similar worries. Whilst she said she didn’t regret the decision, I was left with a huge sense that having lost my dad in 2007, there was a grain of sadness at what could have been, if only she had said ‘yes’. And so that cathartic moment triggered me into action – the Battle over Fear had begun. I returned home feeling determined. After an empowering discussion, together Myles and I threw caution to the wind and paid our deposit on ‘Scooby’ the motorhome, who would carry us on our magical mystery tour. We talked about how to deal with my uncertainties so I could feel safe, although I felt so positive about my new-found freedom, that I trusted all will be well. I too want to travel the world. I’ve been moving about this beautiful country all my life…….Dr Banardos and then Armed services. But now I’m with my beautiful wife who can not bring herself to take the plunge, (…had seriously bad injuries from bike accident many years ago. Now serverly disabled) I read about others dreams coming true and wander if only……I applaud you for taking that next step. Fear holds many of us back, possessions and ” stuff” anchor us, and we live compromised lives, I too have a dream , and I hope when the time is right ( and very soon ) I will have your courage and reap the rewards you have, In my life I’ve been grave and risked everything, and have to say those were the best decisions I’ve ever made, I hope I can learn from my own life experiences and trust myself. For anyone, it is worth trying. Most of us are only here once, we have to make the most of it. That’s such an amazing ode to the power of making those crucial decisions on which life pivots. I’m a firm believer that fear and its opposite number security can be found in all kinds of unexpected places, as well as the more obvious ones. I felt some of those chills when I left a brilliant job to work for myself, and to have the freedom to follow more of my dreams. Although it’s not always been easy, I love that hard-won freedom. I also love that you two are celebrating the call of the road, and are navigating its bumps with style and flair. Wishing you many, many happy adventures. We’ve been traveling for around 2.5 years full-time, and it’s been amazing. We’re always going on new adventures and often think about what life would be like if we didn’t take that leap.